Unlock your Panasonic phone in record time. Valid for both recent and older models. IMEI-based unlocking services that won't void the phone's warranty. Method recommended by Panasonic and network themselves. How to unlock my Panasonic phone with doctorSIM? Once you have requested your unlock code through doctorSIM, you will receive an e-mail with instructions on how to unlock your Panasonic phone. No technical knowledge or software downloads required. Unlocking your Panasonic with doctorSIM is as simple as 1-2-3! How do I unlock my Panasonic with doctorSIM? To unlock your Panasonic with doctorSIM, select the country and network provider your phone is locked to. Once we receive your payment, we'll process your request and within a guaranteed delivery time, you will receive by e-mail an unlock code and a set of instructions on how to complete the unlocking process. If you need help at any point during the unlocking process contact us. Do I need to know the exact model of my Panasonic? No, the unlocking instructions are the same for all models. All that changes is the unlock code which is dependent upon the IMEI number (unique identifier) of the cell phone. This number can be obtained by typing *#06# on the phone's keypad. However, if you are planning on selling it in the future our identify Panasonic model check will provide you with this information. 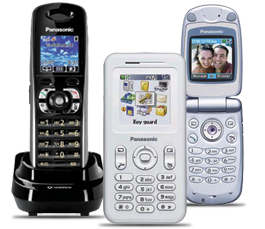 What do I need to unlock a Panasonic cell phone? You need access to the Internet and an e-mail address where we can send the unlock code and step-by-step instructions. You will also need to be able to access the keypad and drop-down menus of the phone. How much does it cost to unlock my Panasonic? The price of an unlock code varies depending on several factors. The exact price will be displayed on the right of the screen when you select the country and network provider your cell phone is locked to. Multiple payment methods are available per country and listed in Step 3 of the request process. Find more information on doctorSIM's payment methods. Do I get a full refund if you cannot unlock my phone? Yes, in the rare occurrence we are unable to unlock your cell phone for any reason under our responsibility, we will issue you a full refund. The guaranteed delivery time depends on the country and to which carrier the phone is locked. The guaranteed delivery time and average delivery time for the previous 20 similar unlockings will be displayed on the screen when you've selected the network provider. Our IMEI-based unlocking method won't void your Panasonic's warranty. You can continue to use your cell phone while we unlock it. Unlock your Panasonic online from the convenience of your home or office. Panasonic recommends our unlocking method. Get your money back if we are unable to unlock your cell phone for any reason under our responsibility. Choose from a wide variety of 100% secure payment methods. Customer support available to assist you throughout the entire unlocking process. We have successfully unlocked over 5 million phones to date.